Candelabras are both functional and beautiful décor pieces, as they can be used to adorn tabletops while providing dramatic and elegant candlelight. 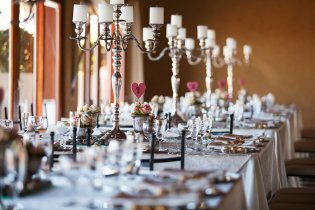 When you are planning an event, consider renting candelabras in Annapolis to give your tables an added element of visual interest and sophistication. Even though you’re probably not relying on candles to provide the majority of the light at your wedding or party, a candelabra can be a classy addition to your event décor. You can choose to place candelabras on every table at your event, or reserve them just for the head tables to make it easier to differentiate between them. When you pair candelabras with beautiful table linens and place settings, you’ll be sending a message that you appreciate the finer things in life. You may even want to place a candelabra on a serving table, or near the wedding cake to draw more eyes to those special areas of interest. Whether you are throwing a corporate party, a birthday party, or a wedding, you’ll have some similar needs for your event. Every event should have the proper supplies so that your guests have a good time and things go off without a hitch. If you are holding your event in a place where supplies are not provided, you’ll have to rent everything you need in order to make the party a success. This may include chairs, tables, and even table linens in Annapolis . It’s easy to make your event a success when you choose party rentals. Read on to learn about the benefits of doing so. Hosting a party can become expensive quickly, especially if you are expecting a large number of guests. You need to provide food, beverages, entertainment, and more, and these costs can really add up. By renting party supplies, you’ll save yourself money by not having to buy new products that you may never need again. Party rentals are cost-effective, so you can stick to your budget and perhaps even have a little left over for splurging. As you are planning your party, you’ll need to determine what sort of theme you want to have. Instead of looking everywhere to find the chairs and table settings you want to fit your vision, a party rental company should be able to provide you with a wide range of styles. You can save yourself time by not having to shop around, as your party rental company will be a one-stop shop for all the supplies you need. Throwing a party takes a lot of work, including setup and teardown. Many party rental companies will deliver the items you’ve rented to your venue, and set them up so you can focus on the other details of your event. You can also have the rentals taken away once the party is over, lessening the stress on you even more. When you are planning a big event, you’ll have many decisions to make. In addition to figuring out the guest list, what foods and beverages to serve, and where to hold the party, there are other details to consider. Using party rentals in Annapolis , such as tables, linens, flatware, and chairs, can save you money and make your event much less stressful. It is essential to provide seating at your event, whether you’re planning a wedding or a corporate party. Keep reading to learn more about selecting chair rentals for your next event. The number of chairs you need at your event will depend not only on how many people you’re expecting, but also the type of event you’re hosting. If you are throwing a party with a sit-down dinner, you definitely need to have enough seating for every guest in attendance. In fact, it’s a good idea to have extra rental chairs on hand in case any of your guests bring friends unexpectedly. If you are throwing an event where you expect there to be more standing and mingling, you should still have seating areas in strategic locations throughout the event venue so that your guests can take a break and rest. As you are deciding on the right chairs to rent, don’t forget to consider what color will look best with your décor. 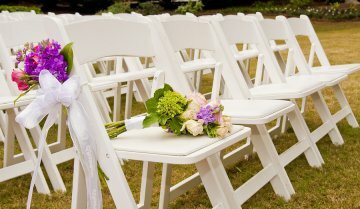 For example, an outdoor summer wedding might do well with white chairs, especially in the area for the ceremony. If you are having a more formal event or a business event, you might want to choose black chairs. Remember that black chairs may heat up more if they are in the sun, so think about whether the chairs will be inside or outside, and if they’ll be covered under a tent or canopy. Folding chairs are convenient and easy to move, and can make your event planning much easier. They are portable and can be carried quickly from one location to another, such as from a wedding ceremony site to the reception area. If you’re like many people, chances are you’ve dreamed about your wedding day for a long time. Planning a wedding takes a lot of work, but it can be made less stressful when you give yourself plenty of lead time. When you decide on a wedding venue, find out if they have everything you need or if you will need rental equipment in Annapolis . Watch this video to learn more about wedding rentals. After you find the perfect wedding venue, remember that your work doesn’t end there. You may need to rent tables and chairs to bring into the venue, along with table linens, flatware, and china. 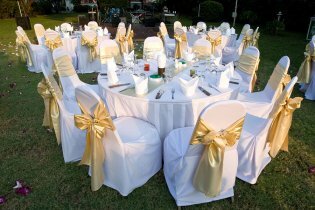 Even if tables and chairs are provided, you may want to consult a rental company about decorative pieces. Work with a reputable local wedding rental company that has experience with delivering, setting up, and taking away rental equipment. You’ll be able to choose from a variety of styles of tables and chairs, and decide which colors of table linens will work best with the rest of your wedding style.